Two separate methods have been employed to calculate the global cancer yield of the Chernobyl accident. The results show between approximately 469,000 and 1.4 million incident cancers in the 10 years and 50 years following exposure. These results agree rather well with earlier estimates by Gofman (1990), Bertell (2006) and epidemiological approaches to deaths using real data by Yablokov (2011) but are much greater than those published by the World Health Organisation and the International Atomic Energy Agency or by Fairlie and Sumner 2006. The agreement between the ECRR2003 method employed and real data on cancer from ex Soviet Union areas contaminated by Chernobyl, from weapons fallout and Sweden after Chernobyl suggests that the current approach to modelling radiation risk based on the ICRP dependence on the external exposures of the Japan A-Bomb survivor cohorts is erroneous (Lesvos Declaration 2009). The matter has significant implications for policy in the case of Fukushima. BSRRW.ORG conclusion is that this means at least 400.000 cancers in 50 years in 200 km radius fr Fukusima. This estimation does not include infertility risks and is based on an IAEA cover upp doses, that may under-report the contamination levels up to 10 times. Japanese government is not evacuating the citizens as IAEA is not reporting the risks!!! The Health of at least 400.000 people will be the Cost for the Nuclear Industry Conspiracy if evacuations do not take place NOW! Quote fr ECRR report Conclusions, p. 12: “1. The ECRR risk model has been applied to the 3 million people living in the 100km radius of the Fukushima catastrophe. Assuming these people remain living there for one year the number of excess cancers predicted by the method is approximately 200,000 in the next 50 years with 100,000 being diagnosed in the next 10 years. If they are evacuated immediately, the number will fall by a significant amount. For those 7 million living between 100km and 200km from the site, the predicted number of cancers is slightly greater with 220,000 extra cancers in the next 50 years and about 100,000 being expressed in the next ten years. These predictions are based on the ECRR risk model and also the findings of cancer risk on Sweden after the Chernobyl accident. ICRP model is currently used to precist the risks from Fukushima, Japan!!! Watch the whole 2 hours long scientific discussion that may stop the apocalyptic process of polluting the earth with radioactive particles that get into human blood through air flows and destroy human DNA irrepearably. Filmed by Ditta Rietuma. The European Committée on Radiation Risks (ECRR) Model: The new era begins. Recent research has shown a failure in the radiation risk model of the International Commission on Radiological Protection (ICRP), which radiation risk agencies in all nations currently use to regulate public exposures. This was the conclusion of radiation scientists from across the world gathered at the ECRR’s 3rd International Conference held in May 2009 on the Island of Lesvos, Greece. The final statement from the conference urged national governments to abandon the ICRP model and, as a matter of urgency, to employ the 2003 model of the ECRR. This Declaration was signed by all the delegates (http://www.euradcom.org/2009/lesvosdeclaration.htm). Evidence was presented at the conference that the errors implicit in the ICRP model have resulted in systemised loss of human life. In an extraordinary development it was reported (http://www.euradcom.org/2009/lesvostranscript.htm) that, in Stockholm on 22nd April, the recently retired Scientific Secretary of the ICRP, Dr Jack Valentin, had conceded that the ICRP model could not be used to predict the health effects of exposures and that for certain internal exposures it was insecure by up to two orders of magnitude. He also said that as he was no longer employed by ICRP he could agree that the ICRP and the United Nations committee on radiation protection (UNSCEAR) had been wrong in not examining the evidence from the Chernobyl accident, and other evidence outlined below, which shows large errors in the ICRP risk model. There is new theoretical and experimental evidence showing that the health effects of the element Uranium have been massively underestimated. Uranium is still contaminating the world following its use as a weapon and is the basis for the nuclear industry. The late health effects of the Chernobyl accident are being found to be enormous, with increases in cancer reported from as far away as Sweden and the United Kingdom. There is also significant excess cancer in studies of people living close to coastal areas of the Irish Sea, contaminated by the Sellafield reprocessing plant. More evidence that small internal doses are hazardous are the increased risks of childhood cancer near nuclear sites in Europe, with a recent German government study showing a 3-fold excess risk of leukemia in children aged 0-4 living within 5 km of all nuclear sites in Germany from 1980-2005. Routine environmental monitoring of radioactivity in Baltic Sea sediments reveals significantly high concentrations of the isotope Caesium-137. Fig 1 shows the results of marine sediment analysis in the 2007 SSI report. 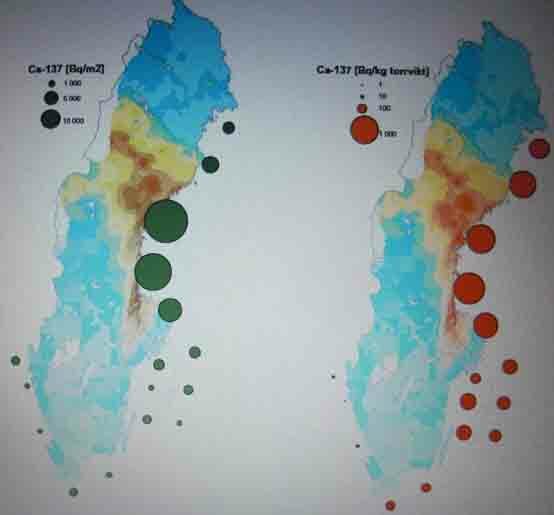 Fig 1 Caesium137 in Baltic Sea marine sediments on the Swedish coast (SSI Report 2007: presented to the Helsinki Commission MORS Stockholm May 2009). The levels shown in this report are alarmingly high; in the northern part of Sweden they exceed 1000Bq/kg and even in the south are generally in the region of 100Bq/kg. 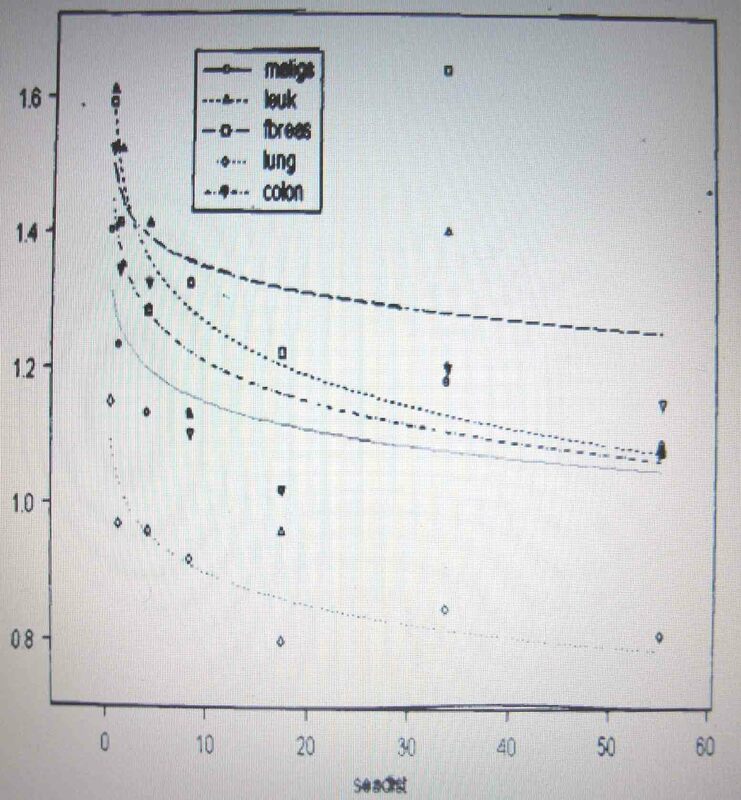 For comparison, the Irish sea sediments, which were severely contaminated by discharges from the Sellafield reprocessing plant, seldom exceeded 300Bq/kg of Cs-137 even at the time of peak emissions in the late 1970s (MAFF 1968-1992). Currently, the RIFE reports of measurements of Cs-137 in the Irish Sea sediments show levels which are significantly lower. For example, the 2009 RIFE report finds 60Bq/kg Cs-137 on the Sellafield beach near the outfall discharge pipe. The mean of all the 62 values of Cs-137 in Cumbria, where the Sellafield discharge pipe is located is 122Bq/kg with a standard deviation of 160Bq/kg. The beach at Seascale, where the famous Child leukemia cluster occurs shows 39Bq/kg of Cs-137. In Wales, where there are child leukaemia clusters around the Menai Straits the levels are now (2009) around 50Bq/kg (Caerhun). Cs-137 can be easily measured using gamma spectrometry: there is a strong spectral line which enables analysis. However, Cs-137 is a Uranium fission product, and is always mixed with other fission and activation products, plutonium and indeed uranium itself. The source of the radioactivity in the Irish Sea is Sellafield discharges and uranium from the fuel fabrication plants in Lancashire and Cheshire, also Chernobyl fallout, together with historic fallout from atmospheric weapons testing. The health risks from exposure to ionizing radiation are currently assessed on the basis of the risk model of the International Commission on Radiological Protection (ICRP), whose most recent report was published in 2007. All legislation in Sweden (and Europe) on the limits for exposure of members of the public to radiation and to radioactivity from contamination is based upon this risk model. In the last ten years or more it has become increasingly clear that the model breaks down for chronic exposures to internal radionuclides i.e. substances which are inhaled or ingested and which remain inside the body. The difference between the predictions of the ICRP model for these exposures and the observations of cancer, leukemia and other disease in populations exposed to these internal radionuclides is very large, which has made it hard for governments to accept that the model can be in error. Nevertheless, the evidence that this is so is now unequivocal. And new developments in theoretical and laboratory radiation biology support the levels of error involved in applying the ICRP model to internal exposures. Epidemiological evidence includes the results of the Chernobyl accident fallout exposures on cancer in Europe and the observations of infant leukaemia in the cohort of children who were exposed in the womb, a situation where only the radiation could be the cause of the increases in risk (Busby2009). The European Committee on Radiation Risk, set up in Brussels in 1997 has provided a report which addresses this error in the ICRP risk model for internal radionuclide exposures (ECRR2003). On the basis of this ECRR model, increases in cancer and ill health would be expected in those who have been exposed to internal fission product radionuclides and to uranium particles. And this is what is found, in all the situations where such exposures occur. It is of some relevance here that the Editor of the latest 2007 Risk Model report of the ICRP, the Scientific Secretary of the ICRP, Dr J Valentin of Stockholm stated at a public meeting in Stockholm in April 2009 that the ICRP model could not be used top predict the health effects of internal radiation exposures because the uncertainties in the model were as high as 500- fold. This interview was captured on video. Valentin retired from his position as Scientific Secretary a few weeks before the meeting. One such situation is in people who live near the sea in areas where the coastal sediments are contaminated with radioactivity. A very large study of populations living near the shores of the Irish Sea was carried out by Green Audit for the Irish State using data from the Wales Cancer Registry. The results were never published in a journal (at the request of the lawyers who commissioned the study) but were presented to the Irish State and to the UK government in the Committee Examining Radiation Risk from Internal Emitters in 2003. A review of the findings was published in Busby 2006 and an outline was also presented at the International conference of the British Nuclear Energy Society in Keble College Oxford in 2002 and is it the proceedings of that conference (Busby 2002). The mechanism proposed to account for the excess risk was based on the trend of Relative Risk with distance from the sea, which correlated exactly with the atmospheric concentration of plutonium in air measured by the Harwell laboratory in the 1980s. 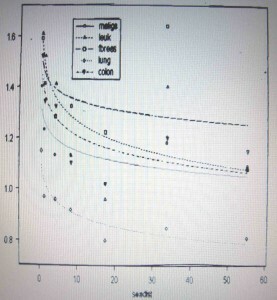 The radioactive sediment is resuspended by wave action and particles are blown inland where they can be inhaled: autopsy measurements made in the 1980s confirmed the presence of plutonium in the tracheobronchial lymph nodes of coastal populations in Cumbria and the trend in sheep faeces of plutonium found in a transect across the UK confirms the same general trend. The Irish sea is less closed than the Baltic sea and has a tidal flow into and out of it, with the result that Cs-137 leaves the Irish Sea (and indeed travels significant distances). However this is not the case with the Baltic which is essentially a closed system. Radioactive material has entered the Baltic from a number of sources. • Material from Chernobyl fed into the Baltic from major rivers from the East. It may be of concern that there are currently plans to locate a major nuclear waste repository near the shores of the Baltic Sea at Forsmark. 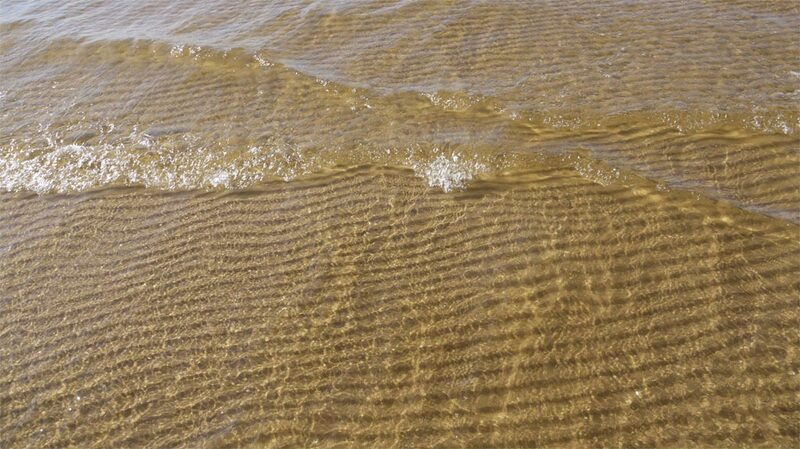 This will almost certainly result in further contamination of the coastal sediments up to levels permitted by the current legislation, and in the event of leakages from the repository, to levels which would result in serious contamination of the already contaminated Baltic sea. The question might be asked, why if this is possible has no-one in the health protection establishment carried out research. The answer seems to be that there is built-in bias and conservatism in the government and European agencies which are supposed to deal with these issues. It is a fact that the first nuclear site child leukaemia cluster at Sellafield was discovered by a TV company and not by any medical agency. The nuclear-military lobby has enormous power. In 1959 an agreement was made between the World Health Organisation and the International Atomic Energy Agency which effectively left research on the health effects of ionizing radiatiomn to the IAEA, cutting out the WHO. This agreement is still in force, and is the reason why no real research has been carried out on the health effects of the Chernobyl accident. The EU funded Policy Information Network on Child Helath and Environment made a final report on this issue in 2006 and drew attention to bias that exists in the WEU in the perception of risk from environmental exposures, and drew attention to the need for independent research in this area. Green Audit has a track record since 1992 when it was founded of making independent studies of environmental risk, especially in the area of radioactive contamination (see www.greenaudit.org). Since then Green Audit has carried out tens of major studies on this issue including those already referred to above. If the generally lower levels of radioactivity in the sediments of the Irish sea have caused increases in cancer in coastal populations, we should expect a similar effect in the Baltic, where the levels of radioactivity are about ten times greater than the peak levels and perhaps 50 times the current levels on the coast of the Irish sea. Accordingly, it is important to see if this is the case by carrying out independent research in which cancer incidence rates in Sweden are correlated with distance from the coast and with radiation levels in coastal sediment in the same way as the Irish Sea studies were conducted. Sweden has a good cancer registry and population data from parish areas are available. Radiation measurements for Cs-137 can be made using a portable gamma radiation spectrometer and samples can be independently analysed for a range of other radionuclides. Tondel et al (2004) studied Chernobyl effects in North Sweden and found significant increases in cancer in areas categorised by Cs-137 deposition. The method employed by Tondel et al may be extended to look at the effects of living near the coast and comparing this with living inland. The results will be valuable for informing public health policy and also for decisions relating to the developments of nuclear energy in the Baltic nations. A similar proposal will be made for examining populations in Finland which has an excellent cancer registry. The proposal is for a 2 year study of cancer rates in small areas of Sweden and Finland. The proposed cohort for study is the coastal and inland populations populations of Norbotten, Vasterbotten, Vasternorrland, Gavleborg, Kopparberg in the North and Ostergotland, Sodermanland, Kalmar, Blekinge, Malmohus, Haslland and Alvsborg in the South. Measurements of radiation will be obtained from the Swedish SSI and also made independently on coastal intertidal sediments, especially near nuclear sites, if these are not available. The method will determine Standardised Incidence Ratios based upon national data for a central year and will look at all malignancies (excluding non melanoma skin cancers) and female breast cancer, lung cancer, prostate cancer, leukaemia (CLL and ALL) all ages and leukaemia in young people 0-14. In Finland, it is proposed that studies will be similarly made on populations of Lappi, Oulu, Vaasa and Turku-Pori. Necessary ethical procedures for the studies in each country will be followed.